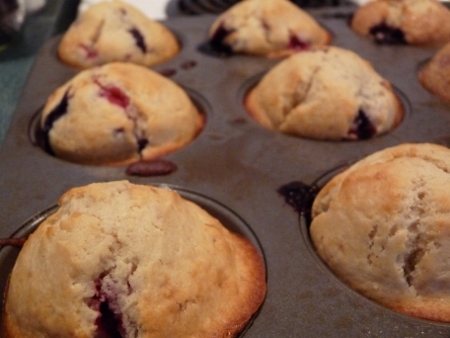 Fruit filled muffins! 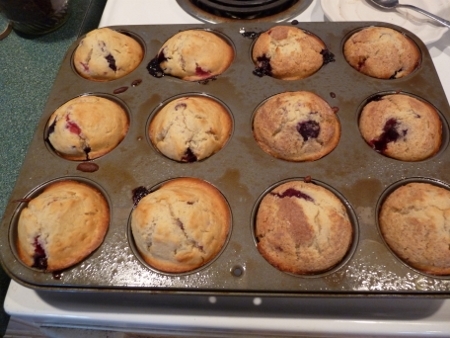 This is using the basic muffin recipe from my mom’s (Grandma McAndrew) old black book. A dozen fruit filled muffins...not for long! This is an old black binder that she put together when first married, my sister said some of the recipes were written in her mother’s hand (my Grandma Judge). I just love that and am so happy that I inherited it. Many of the recipes I share here are old favorites of our family and I hope my own boys or nieces and nephews will find the instructions and recipes here helpful. My mom and grandma would like knowing there recipes were being passed down as it were. ahmm...need I say more? Let me at it! This recipe is an old favorite but I added the fruit, which was great! You can sprinkle the tops with cinnamon and sugar. Split fruit filled muffin, waiting to be eaten. 1. Sift dry ingredients into a bowl then give it a good mix with a whisk to make sure it’s blended. You can store it in a jar at this point for when you need it. 2. Cut the shortening into the dry ingredients using a pastry blender, till it’s all crumbly looking. 5. Have oven pre-heated and spray or grease a 12 muffin pan. Fill cups dividing batter up between them. If you want add a sprinkle of cinnamon and sugar to the top before baking, I did on half to see if I liked it; I liked both ways. Bake 20-25 minutes, mine took 23. 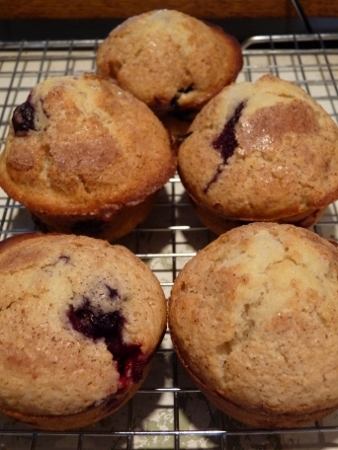 When done and after cooling a bit, take a knife and gently go around each muffin while they’re warm. Then gently turn each one a bit in the pan to make sure they’re loose. Remove from pan while a bit warm to finish cooling on a rack. 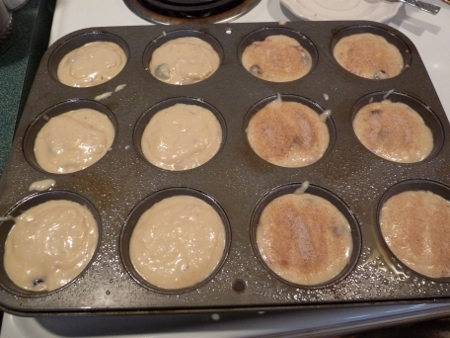 Here’s some pictures of the muffins being prepared for baking and after. Batter in the cups and ready for baking. The batter fills the cups right up when there’s fruit in it. The ones on the right have the cinnamon and sugar on top. 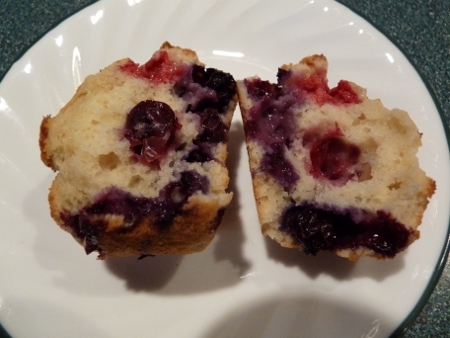 Blueberry - Raspberry muffins hot from the oven! Oh the house smelled wonderful when these came out! 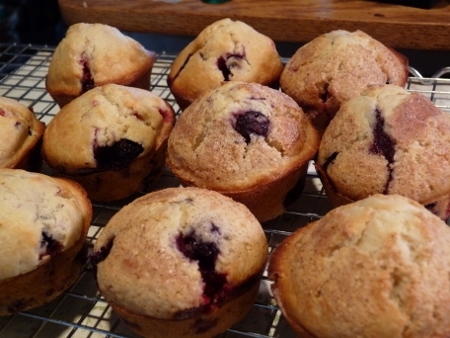 Blueberry - Raspberry Muffins without cinnamon and sugar. 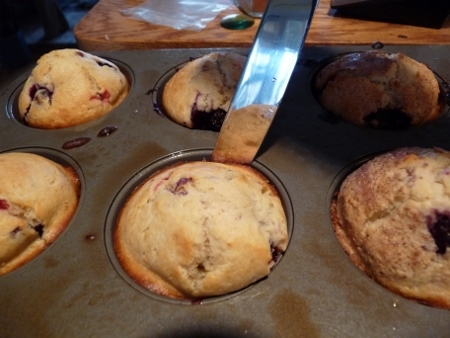 Loosen muffins with a knife while they are warm. 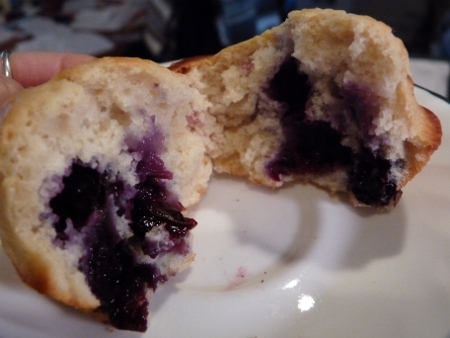 Take a knife and gently go around each muffin while they’re warm. Then gently turn each one a bit in the pan to make sure they’re loose. Remove from pan while a bit warm to finish cooling on a rack. Take peeled, chopped apple and put some batter in a cup, then liberal amount of apple topped with more batter. Put liberal sprinkling of cinnamon on top and sugar on top. YUM. raspberry or strawberry jelly -1 tsp on top before baking. 1 T savory spices or herbs of your choice.